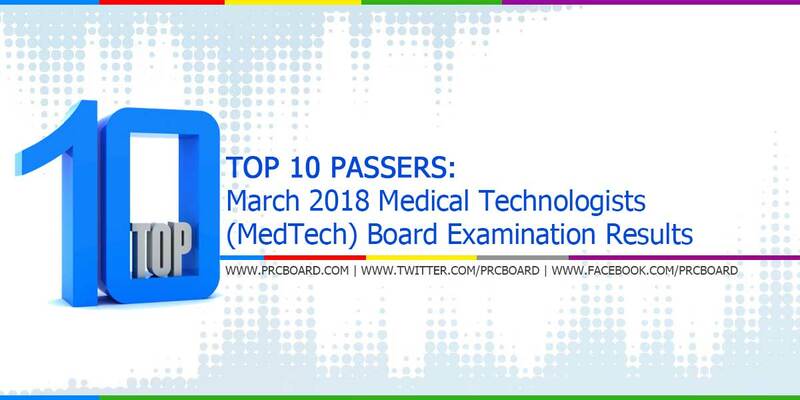 The official results and top 10 passers of March 2018 Medical Technologist (MedTech) board exam, conducted by Professional Regulation Commission (PRC) Board of Medical Technology are released three (3) working days after the last day of board examination. PRC recognizes the top 10 examinees who garnered the highest examination rating in any of its administered licensure exam. Shown below is the complete list of March 2018 MedTech Board Exam top 10 examinees including the school they're from as well as their rating. The list is courtesy of the Professional Regulation Commission. As mentioned in the main page of this article, official results will be published by March 20, 2018 (Tuesday), or in three (3) working days after the last day of exams. Meanwhile, to keep updated on the official results of March 2018 MedTech Licensure exams, you may also follow us at our social media accounts via Facebook and Twitter. ang tagal naman ng result kelan kaya lalabas result ng Med. tech. ganun talaga pag inaantay mo.. tagal lumabas.. pabayaan mo lang at lalabas din yan.. hahahaha.. congrats in advance..
Grabe tagal hahahhaha mamamatay na yung bestfriend ko sa kaba kaka-antay. Ngayon na ba malalaman ang result? nakakabaliw magantay. pero it's all in God's hands now. Meron na po kaya ngayong midnight? Anong oras po lalabas results? Good luck everyone! RMT soon... In God's name! what time po yung result lalabas? what time po ba lalabas? laging puno ang simbahan simula noong last week.. malamang bukas kunti na..
Yung puso ng katabi ko lalabas na sa sobrang kaba. di ko na mabilang ilang beses na ako nagrerefresh haha. Go manong rico opeña RMT kna soon.